Harris bipods are quick detachable and clamp to the sling swivel stud already installed in most rifles, we offer adapters for those rifles that do not have a factory installed studs. 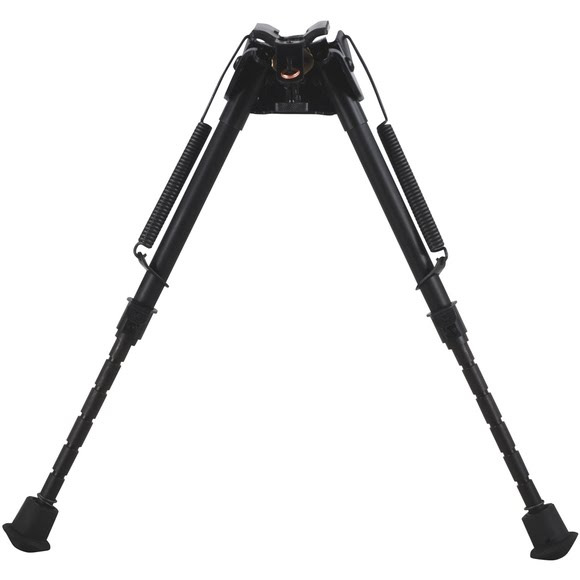 Series "S": Swivels to either side for instant leveling on uneven ground. Hinged base has tension adjustment and buffer springs to eliminate tremor or looseness. The legs eject by spring action. Harris bipods are quick detachable and clamp to the sling swivel stud already installed in most rifles, we offer adapters for those rifles that do not have a factory installed studs. Series "S": Swivels to either side for instant leveling on uneven ground. Hinged base has tension adjustment and buffer springs to eliminate tremor or looseness. The legs eject by spring action. Height settings are in 1" increments. Quick attach/detach to any rifle with factory installed detachable sling swivel. Extends from 9” to 13” quickly and easily. Spring loaded legs fold up and out of the way for an easy carry or freehand shooting.